Gentrification knows no mercy. 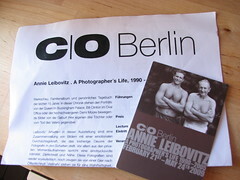 Not even for the C/O Berlin photo gallery, an institution of sorts in the Berlin art scene. I had the chance to visit an Annie Leibovitz exhibit last year, and I remember paying no more than 6 Euros to see her commercial and more intimate work. I think it was a bargain. The news from Der Spiegel took me aback. They need to pack their bags by March 2011. Their next home is still unkown. At the very least, I hope they find one that is appropriate and just as beautiful in Berlin.